Earlier this morning, Andrew Allemann broke the news that the auction for the .Web new gTLD extension “has concluded with a $135 million price.” I really don’t understand why .Web is so appealing that an entity reportedly paid 9 figures for the rights to operate the extension. In my opinion, Internet-related terms such as “web” and “world wide web” are less widely used today than years ago. Web seems almost passé , in my opinion, although the longer term “website” is still used by pretty much everyone. Although I am not really an investor in the new extensions, I can see why companies and people would use them. If you’re a local lawyer who doesn’t want to pay for a .com in the aftermarket, perhaps buying a less expensive .lawyer or .attorney domain name makes sense. The same goes for other professions. With .web, I don’t see that same type of affinity. As Andrew Allemann pointed out in his article, “Neustar paid about $100 million to acquire the .co top level domain name, which already had over 1.5 million registrations.” According to nTLDStats.com, there are only three new gTLD extensions that have 1 million + registered domain names: .XYZ, .Top, and .Wang. From what I understand, many of these domain names were registered at very, very low prices (ie .XYZ domain names being sold for a penny). I don’t recall the .CO registry offering very low prices on registrations, and I can’t recall any major discounting on .CO domain name renewals. After reading about the .Web auction result, I don’t understand how a company is going to be able to sell enough domain names to make its 9 figure investment back. From the beginning (few years ago), it was for me the most appealing new extension. It’s maybe not a popular searched term but it’s the way people talk about web sites in most languages. I am almost sure this one will have a crazy success. You have the standard .com, then you have everything else. Web is a dated term for sure. Depending on who won if, if it is google then watch out, everyone else will have to mark all the good keywords with insane premiums. Same thing was said with .online there is also .onl, .xyz was meant as the ending to a domain also. People say net others say web, but I hear net more often. We have all seen the investment grade value of .net fall in the past 5 years. If the registry is quick they might be able to bleed a lot of money away from newbies, and wannabe domain billionaires… In the long run just add it to the list of other confusing extensions that were supposed to change the Internet space. I have the feeling the auction winner share my enthousiasm for the .web and he proved it. @Francios- In good old USA, we say dot com and who cares what others say. It is the market share!!! All I know is dot com is the #1. Those people invested in dot whatever, are they really making money? and if they do, it means they have to work really really hard to earn a penny and for how long? As for me, .NET is more appealing than .WEB if we are to compare the two. “I need to get on the net”. Calling your ISP: “I’m having issues getting on the net”. — No one is really talking about “getting on the web”. Net is a pop/cool and short abbreviation for internet. Web is sometimes considered short for “website”. Most people, myself included, often say website in full or just ‘site’ for short. That said, unless “web” starts getting hyped as the new cool way to say “websites” and gains traction, I don’t see it being any more successful than .top or .XYZ, etc. Some think the introduction of .web will overthrow .com; I don’t see that ever happening. I don’t like it either but it is a very easy word to remember, ideally suited for the internet and only one syllable and everybody and their mother for the last 2-3 years has said .WEB is going to be the hottest one of the bunch. Who knows. I still hear people refer to ‘the web’ often, I don’t know what everyone else is talking about. People often say ‘it’s on the web’, or ‘you can find it on the web’. ‘Online’ is still used a lot but it’s long for a domain extension. And I think ‘Web’ has a higher coolness factor than ‘Net’, why I don’t know. If we are looking at domains being used for many more years, that is a lot of time to recoup the $145 million, and with premium auctions, reserved names, premium word registration fees, etc, as will unfortuantely most likely occur, it can be recouped faster. At a minimum it will become one of the most popular new gtlds if the reg fee is decent for non-premium names. And $145 million isn’t much of a gamble for a company like Google when you look at their earnings, they have made worse investments and lost more money on other ventures. So who won it? Regarding its value, although it is a somewhat outdated term, words come and go. It’s certainly as (if not more) meaningful than .com. It’s just as short and easy to pronounce. I’m betting it is web.com that won it (I don’t really know and have no inside info). I just think that they have the most invested in the brand of “web” and that they can’t afford to allow someone else to control it. IMHO. This was much too high a price to pay – perhaps even 5-10x more than anyone would have expected (or paid). I am sure Canadians will love this new tld as they prefer uggly .ca over a $500 premium .com and .net make tour site old and not professional. There will be plenty of low vallue .web registered and used by a lot of people. However, .com is still the king. .web is good if you are doing business only online. will you get CompanyWeb.com for your business or Company.com? This was a very smart and welcome move for Verisign if the report is true: http://domainnamewire.com/2016/07/28/looks-like-verisign-bought-web-domain-135-million-sec-filing/. None of the money-grabbing premium nonsense of recent years, and a return the relative equality of opportunity that used to exist when new TLD’s like .us, .info and .biz were released, including for the best keywords. I can’t see the appeal either. There are plenty of available names in well-established extensions like .NET, .BIZ, and .INFO so why do we need yet another generic TLD? 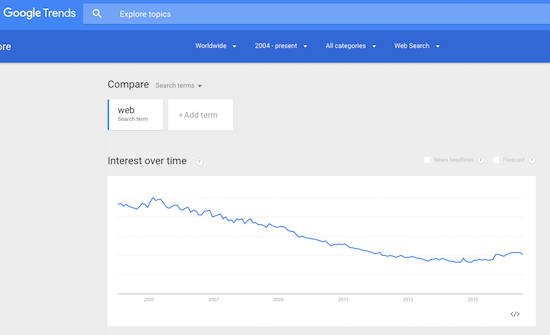 It also feels somewhat redundant now that the trend is to drop the www from the beginning of a URL. Why are we now tacking web on at the end?